Many summer events, including festes majors, are being cancelled during the three days of mourning declared after the terror attacks in Barcelona and Cambrils. 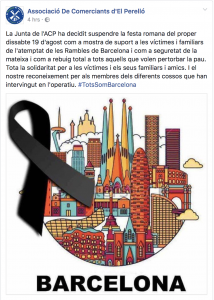 Throughout today, town halls and tourist offices across the Terres de l’Ebre and Catalunya posted messages on social media and made loudspeaker announcements cancelling events. Festes were cancelled in the town of Alcanar in the south of Catalunya, where it is suspected that attempts to create bombs were carried out earlier this week resulting in an explosion that killed one person. 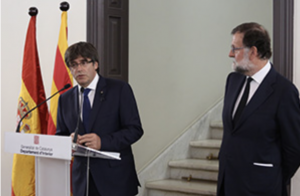 In El Perelló, the Roman night planned for Saturday has been cancelled. Deltebre’s festes majors have been suspended for 24 hours. Further afield, Tarragona has cancelled Sant Magi festivities for the three days of mourning. We will attempt to update the Ebre Connect events calendar to reflect changes, but please check with the relevant tourist office before you attend any events during the next few days.